Many analysts have argued that Trump’s promises to bring back US manufacturing paved the way for his election victory. This column compares electoral data from 2016 with previous elections and argues that education and race were far bigger factors than a county’s share of manufacturing jobs in determining the change in its voting from the 2012 election. In addition, relatively low voting rates among Democratic voters were a bigger contributor to the results than high voting rates among Republicans. Trump did not win the white working class, Clinton lost it. President Donald Trump’s election victory last year was driven in part by support he got in the traditionally Democratic parts of the industrial Northeast and Midwest of the US. Many analysts have argued that Trump’s promises to bring back US manufacturing hollowed out by trade and technology changes paved the way for his achievement. Recent empirical evidence shows that trade shocks can influence voting patterns. Autor et al. (2016) find that import competition from China is associated with increased political polarisation in US congressional elections, as measured by the number of moderate incumbents who lost their seats. Using data on voting patterns in six presidential elections, Jensen et al. (2016) extend this analysis to include trade in services and exports, and find that while rising imports are associated with more polarisation, rising exports are associated with more support for the incumbent. Che et al. (2016) find that greater import competition from China is correlated with increases in election turnout and the share of votes for a Democrat in congressional elections. The data show that this bit of conventional wisdom might be misplaced. Education and race were far bigger factors in determining the change in voting results from the 2012 election. These two factors alone explain more than 70% of the variation in the Republican vote share across counties, as compared with the last election, and more than 80% in the swing states. And within manufacturing, race mattered greatly: only the predominantly white manufacturing counties were drawn to Trump’s message. Racially diverse manufacturing counties rejected it. These twin factors roughly cancelled each other out. In the end, whether or not manufacturing was part of a county’s economic base did not have much of an effect on its change in voting behaviour. In a new paper, Dario Sidhu and I examine electoral data from the 2016 compared with previous presidential elections (Freund and Sidhu 2017). 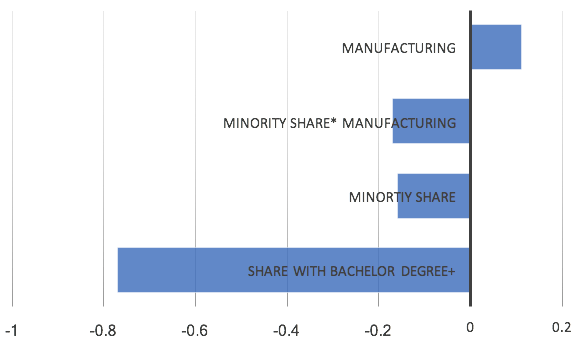 The county-by-county breakdown in the data shows that on aggregate, manufacturing jobs did not play a significant role in the election results. When economics, identity, and demographic variables were considered together, the share of employees in manufacturing was not significantly associated with increased support for Donald Trump, versus Mitt Romney in 2012. Even more striking, counties where manufacturing declined since 2000 – many of which received special attention during the campaign – also did not have an increase in their vote share for Trump from four years before. None of this is to say manufacturing as an economic foundation for a county did not matter at all in the election. But it boosted Trump only in counties that were predominately white. In mostly white manufacturing counties, there was a significant increase in the Republican vote share since 2012. In more racially and ethnically diverse manufacturing counties (above average share of black and Hispanic residents), there was a significant decline in the share of votes going to the Republican candidate. On aggregate, these effects roughly offset each other, with the net result that the presence of manufacturing in a county (or the extent of job loss) was not associated with the result. To the extent manufacturing played a role, it was through the ethnic makeup of counties. The impact of this effect was magnified in crucial swing states, where counties are on average less diverse than the nation as a whole. Notes: Standardized coefficients. Additional controls, median wage, unemployment, labour force participation, age, religion, county size. Source: Freund and Sidhu (2017). Why are counties polarised within manufacturing by race? There are two potential explanations for why predominantly white manufacturing counties became more Republican and diverse manufacturing counties voted more Democratic in this election. The first is that economic shocks were different across white and diverse counties. Perhaps white manufacturing towns specialise in products more prone to technological change or facing pronounced import competition; alternatively, white manufacturing towns may have been largely one company towns with few alternative employment opportunities. The second is that the two groups reacted differently to economic changes that have occurred over time. It is possible that white manufacturing towns rejected existing policies, such as openness to trade and increased income redistribution (for example, through the Affordable Care Act); while diverse manufacturing towns rejected the message that economic conditions in the US were deteriorating. The analysis shows that the second explanation – different reactions to economic change – is more consistent with the data. Perhaps most telling, comparing the 2016 election results with the county’s share of employment in manufacturing from 1986 – when manufacturing employment was near its peak and one in four manufacturing workers was in a union – the same polarisation is evident. Historical manufacturing counties that are mostly white voted more Republican, but historical manufacturing towns that are relatively diverse voted more Democratic, as compared with 2012. Does this mean the population is becoming more polarised? Morris Fiorina, a political scientist at Stanford University, has shown that polarisation can be driven by the electorate or the candidates (Fiorina 2004). While a polarised population – with a large group on the right and a large group on the left – produces a split electorate, polarising candidates can yield a similar outcome, even if most of the population has centrist political views. The difference is that with an increasingly polarised electorate, voter participation should logically increase, as each group is tied to its candidate and opposed to the alternate. In contrast, with polarising candidates, the middle of the distribution is unsatisfied, so voter participation should in theory decrease. When other factors are eliminated, the data show that the rise in the Republican share of votes in white manufacturing counties was largely due to a drop in Democratic votes; while the rise in the Democratic share in non-white manufacturing counties was driven by a relatively higher drop in Republican votes. In addition, on average across counties, as compared with 2012, relatively low voting rates among Democratic voters was a bigger contributor to the results than high voting rates among Republicans. Put differently, Trump did not win the white working class, Clinton lost it. The 2016 election outcome is thus more consistent with Fiorina’s example of polarising candidates than a polarised electorate. The good news is that Americans are probably far less divided then they appear. The bad news is that the US desperately needs a more centrist and less partisan government to unify and lead, but that seems unlikely anytime soon. Autor, D, D Dorn, G Hanson, and K Majlesi (2016), “Importing Political Polarization? The Electoral Consequences of Rising Trade Exposure”, NBER Working Paper No. 22637. Che, Y, Y Lu, J R Pierce, P K Schott and Z Tao (2016), “Does Trade Liberalization with China Influence US Elections?”, NBER Working Paper No. 22178. Fiorina, M (2004), Culture War? The Myth of a Polarized America, Stanford University Press. Freund, C and D Sidhu (2017), “Manufacturing and the 2016 Election: An Analysis of US Presidential Election Data”, PIIE Working Paper No. 17-7. Jensen, J B, D P Quinn and Ss Weymouth (2016): “Winners and Losers in International Trade: The Effects on US Presidential Voting,” NBER Working Paper No. 21899.